Yesterday Atlus teased us about a new Limited Edition heading our way, and today we finally learn what that is! 64-page Hardcover Art Book – Filled with the original drawings from the legendary George Kamitani and Vanillaware. Potion Recipe T-shirt – This large-size t-shirt is emblazoned with a helpful reminder of one of the more common uses of Alchemy in Odin Sphere Leifthrasir: turning the living Mandragora plant creatures (Habaneristos, in this case) into potions vital for survival. Collector’s Metal Slipcase – The PS4 game will come nestled in a special metal slipcase with the game’s key art on the front, and a not-yet-revealed image on the reverse. Art Print – Also included with the game will be a high-quality art print with another not-yet-revealed (but different) design. Premium Outer Box – All the contents in the premium edition will be packaged in a large, sturdy outer box. This version of the game is exclusive to PS4 and will retail for $79.99! This does indeed seem like Atlus’s biggest Limited Edition to date! It will be amazing to see how they top this one in the future! However what of the PS3 and PS Vita versions of the game? Or the people who don’t want to spend the extra money on the Limited Edition? Well never fear our friends at Atlus have you covered! The Launch Editions of the game comes with a soft cover art book with your purchase! Odin Sphere Leifthrasir launches Spring 2016. Dengeki Bunko: Fighting Climax is a solid yet very simple 2D fighting game. This game is similar to that of J-Stars in the sense that they use characters from alternate forms of media. Where J-Stars uses characters from their Weekly Shounen JUMP franchises (Bleach, Naruto, One Piece, etc); Dengeki Bunko: Fighting Climax uses characters from Dengeki Bunko‘s popular light novel. Seeing characters like Shizou from Durarara!! and Kirino Kousaka from My Little Sister Can’t Be This Cute fight each other seems funny and a little jarring, but seeing characters like Kuroyukihime from Accel World and Kirito from Sword Art Online feels like eye-candy considering they’re from the same author. Thank you Atlus USA for providing us with a review copy! Persona 4 Dancing All Night is looking to be the big sendoff Atlus wishes to give the Persona 4 series before transitioning into Persona 5. If someone was to ask me what stands out the most to me about Persona 4 or Persona 4 Golden I would tell them two things, the games music and its story. What this game does is take both those elements and mixes them together almost perfectly. As with all Preview’s, this is my first impression of the game, opinions are subject to change in the final review. 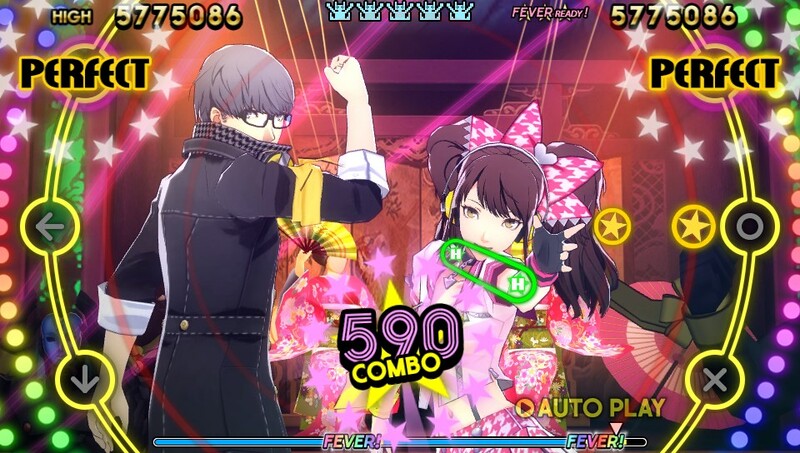 I am going to be honest, when I first saw Persona 4 Dancing All Night I was a bit disappointed. I thought Persona Q was a good sendoff of both the Persona 3 and Persona 4 team. So I kind of wrote this game off at first, sure I thought it would be good, I mean its Persona, but I didn’t think it would be anything ground breaking to me, that it would just be a good rhythm game with a lackluster story along the lines of Arena and Ultimax. Needless to say when I first started to play the game I was surprised to how much was actually there. You are free to go ahead and unlock all the songs right from the start without having to go into the games story mode. The selections of songs to start out with were pretty awesome, and unlocking all the other songs were a bit of a treat. The game plays like a standard rhythm game, press the buttons as they slide over their respective icons on the screen. However it takes a bit of getting use to as how the two button prompts are on opposite sides of the screen, I found myself going cross-eyed at times, but I eventually learned to just go with the flow and rhythm of the game. The selections of songs and remixes are amazing, and the different range in difficulty prevents things from getting dull, there are also a lot of items you can buy to make things easier for you, or mix things up and have the songs play completely different than what you were used to. There isn’t much else I can say about this without going too deep into it like a review, but what I can say is that the selection of music is great, and the dance choreography is top notch, I’ll never get tired of watching certain duos dancing to my favorite songs. Now let’s talk a little bit about the story mode. Don’t worry no spoilers here, but I will say that this games story is very superb for what it is. For a rhythm game I did not expect to see such an in depth story, but then again it is Persona. This games story makes the game feel more like an actual Persona 4 sequel than that of Arena and Ultimax, all the same feelings you got from Persona 4’s narrative are used in this game which honestly is a welcome surprise. The story is quite extensive, so don’t expect a short, charming and quick story that is used as a tutorial for all the songs. So far Persona 4 Dancing All Night is shaping up to be a great send off for the Persona 4 team, the music in this game is awesome to listen to, and the game really tries to get you into each song’s rhythm as you play through each song in Free Mode, and the games story is very reminiscent of the original Persona 4 story. I can’t wait to go back and continue playing this game and trying to perfect each song. Revealed at the SCEJA conference, Danganronpa 3 has finally made its appearance and is entitled, Danganronpa V3. I have no idea what’s going on in this trailer, but you know what, it’s Danganronpa with good old-fashioned court battles. Although here it looks like multiple people will be speaking at once, and it’s not just some white noise either. No release date has been announced yet. You know, Gammald is right. There are a ton of games to be excited about this holiday. Metal Gear Solid V and Danganronpa: Another Episode just came out, Fallout 4 this November, Just Cause 3 and Hitman are this December, with Persona 5 thrown into the mix too? There are a ton of huge games this holiday, and a lot of smaller ones too. As such, here is my list for my top 5 games this holiday season. A review copy has been provided by Atlus. Dungeon Travelers 2: The Royal Library & the Monster Seal is a hard, but well-designed Dungeon Role Playing Game developed by STING. You may know STING for their other games such as Yggdra and Rivera on PSP, and most recently HyperDevotion Noire on Vita. They are actually working on the sequel to this game Dungeon Travelers 2-2 in Japan right now which will come out in 2016.